It’s two years today that Jenny left home and never returned. Over the last 2 weeks, Ann and I have been putting up some new posters in and around Richmond. Despite the recent development with the arrest and charge, we know we still have difficult days ahead and we felt we needed to keep the profile high, that Jenny has still not been found. a. Two Years on and I’m Still Gone. Does Anyone Know Where I Am? b. Two Years and Too Many Tears. Does Anyone Know Where I Am? These words are printed on various watermarked backgrounds, including a full page colour photo of Jenny, and an Audio Angel (full size and smaller multiples), and a black and white still from a video of Jen playing in the band. All have details of the blog and CrimeStoppers at the bottom. 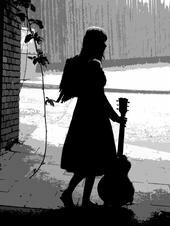 The Audio Angel is a silhouette of a girl with wings and a guitar and it appears in all the posters, either as a large grey background watermark, or a small black & white image. “Unseen, unheard, you are always near, yet we don’t know where you are? So missed, so loved, so very dear. Loved and remembered by Mum & Dad, your brothers and all the family”.